You are currently browsing the tag archive for the ‘Cultures vegetables’ tag. Carrots with Class… or was it Culture? It’s the latest thing isn’t it, cultured veggies. Pete Evans is doing it… and well, he’s someone isn’t he? He copped a lot of flack a while back for activating his nuts, but that’s a whole ‘nother blog post! We’ve been eating them, or their inferior cousins, for probably our whole lives and didn’t even know it. 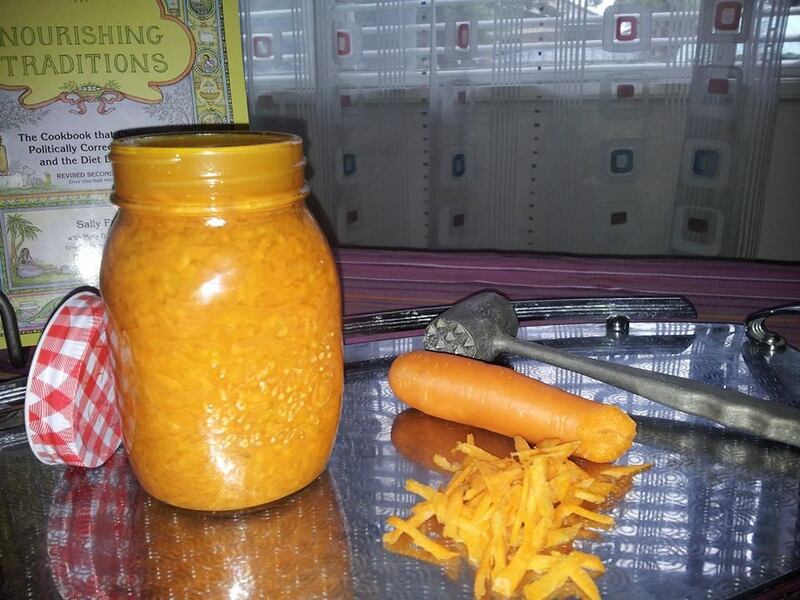 Saurkraut, gerkins, pickled onions… that weird cauliflower/carrot/capsicum? veggie mix in a large jar that my Pop in Queensland eats every Christmas… whatever it is, it’s made appearances, you’ve seen it right? Unfortunately, most store-bought cultured veg has been made using either vinegar and/or sugar, and low-grade salt, rendering it almost entirely useless in terms of nutritional benefit. Traditional cultured veggies were not just a means of preserving veggies pre-refrigeration, they were also a nutritional powerhouse. Full of good bacteria, probiotics and enzymes that aid digestion. They really are good for you and should be eaten daily! Not something to be forced down, but something that actually tastes good… like those yummy little piles of pickles you eat with your indian food… or that delicious morsel of Kimchi with your Korean BBQ. Honestly, awesome! So i thought I’d start off easy and try and make something the kids might like to. Ginger Carrots it is then! full to the brim with carrotty goodness! Combine in bowl and pound with a meat mallet or other wooden implement. Once the juice is released, pop into a jar. Make sure the carrots are pushed down under the liquid. Pop on a lid and place in the kitchen somewhere for 3 days. Now you can start eating it – and store it in the fridge!